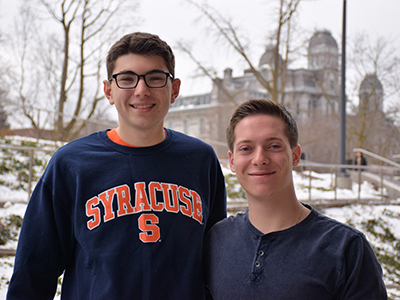 Syracuse University student startups OptechVR—co-founded by Whitman first-year student Matt Shumer and Newhouse first-year student Sam Hollander—and Tableau Media—a venture by Hanna Seraji, an anthropology, women’s and gender studies and communication and rhetorical studies major, along with SU alumna Gabriela Holliman-Lopez—are among the 32 college student startup teams from across the nation heading to the semi-final round in the 2018-19 Student Startup Madness (SSM) tournament, where they will compete for top honors and the SSM National Championship. The semi-finalist teams (SSM 32) come from 27 different colleges and universities across the country and have digital products and services in more than a dozen different industries. OptechVR is developing the world’s first multiplayer, easy-to-use VR headset, incorporating cutting-edge technology at an affordable price. The team is working with the Blackstone LaunchPad powered by Techstars at Syracuse University Libraries to develop and commercialize the idea. Tableau Media is an online interdisciplinary and intersectional collaboration that spotlights marginalized voices and offers complex and credible analysis of social and cultural issues. Student Startup Madness is the only nationwide collegiate tournament focused on digital media startups. It affords college student startups the opportunity to compete against fellow student entrepreneurs, grab the attention of potential investors and supporters, and build an elite professional network. At the SSM finals at South By Southwest Interactive in March in Austin, Texas, eight finalists—the Entrepreneurial Eight—will pitch their business to well-known investors and entrepreneurs who can help them take their early-stage ventures toward success. The SSM 32 feature college student ventures that aim to disrupt education, transform influencer marketing, develop podcasts on-the-fly, and create rec-leagues for esports gamers and new VR/AR worlds. New online and mobile services include breakfast delivery that has taken logistics to the next level, AI-powered cleaning on demand, ridesharing for parents, and all kinds of services for shopping and socializing. Many use their college ventures to create social impact, such as anonymous tracking of on-campus sexual harassment, AI assistance for the visually impaired, and creating crowdsourced accountability in factories in developing countries to combat human rights abuses. Technology-based ventures include blockchain for personal data, innovative speaker technology, natural language processing to monitor employee morale, sonar in cars, new kinds of augmented and virtual reality, miniaturized electronics and artificial intelligence everywhere. Read full descriptions of each startup here. Student startups from colleges across the nation applied online between August and early December. The first round of competition was held online among the 64 startup teams, with judging conducted via Gust.com, a platform used by angel investors around the world. Thirty-two semi-finalists were chosen to advance to the next round. By late January, the Entrepreneurial Eight finalists will be selected and invited to pitch to a well-known panel of entrepreneurs, venture capitalists and investors at the Student Startup Madness national finals in Austin, Texas, on Monday, March 11, 2019. The SSM Finals and Championship event will be held at one of SXSW’s main venues in the downtown Austin Hilton hotel conference center. The 2018-19 SSM tournament has been promoted and supported by 13 anchor universities in eight regions across the country: Arizona State University (Southwest), Cornell University (Northeast), Bucknell University (Mid-Atlantic), Georgia State University (Southeast), Michigan State University (Great Lakes), Saint Louis University (Midwest), Seton Hall University (Northeast), University of Florida (Southeast), University of Illinois at Urbana-Champaign (Midwest), University of Maryland (Mid-Atlantic), University of Southern California (West), University of Washington at Tacoma (Northwest) and Xavier University (Great Lakes). SSM also cross-promotes the tournament with Women 2.0, the leading media brand for the next generation of technology leaders, and Student Veterans of America, a coalition of student-veteran groups on more than 1,300 college campuses across the globe. SSM also partners with companies such as DraperU Ventures (with its Draper University entrepreneurship programs), which helps offset the costs of running the tournament. These organizations believe in the power of American entrepreneurship and innovation on our college campuses. Student Startup Madness debuted in 2012 at SXSW Interactive with a launch event and kick-off pitchfest, where five student startup teams representing eight colleges and universities pitched their ventures and won prizes. Today it is a national tournament and a perennial part of SXSW. For more information on Student Startup Madness, visit studentstartupmadness.com) and follow on Facebook and Twitter: @StartupMad.